You'll be £10.19 closer to your next £10.00 credit when you purchase Yearbook of Astronomy 2019. What's this? An inspiration to amateur and professional astronomers alike, the Yearbook of Astronomy warrants a place on the bookshelf of all sky watchers and stargazers. 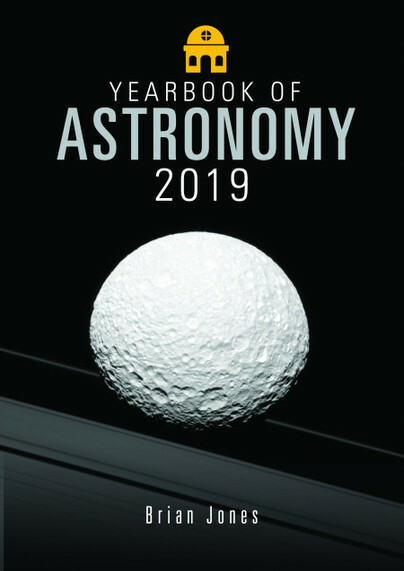 Maintaining its appealing style and presentation, the Yearbook of Astronomy 2019 contains an authoritative set of sky charts and comprehensive jargon-free monthly sky notes to enable backyard astronomers everywhere to plan their viewing of the year’s eclipses, comets, meteor showers and deep sky objects. We are extremely fortunate to live on the wild North Norfolk Coast, where a two minte walk takes me away from any light pollution – earlier this month I was privileged to see Venus, Jupiter and Saturn lined up across the southern horizon, and this magnificent book will enable me to better understand what I’m looking at. Priceless! BRIAN JONES hails from Bradford in the West Riding of Yorkshire and was a founder member of the Bradford Astronomical Society. He developed a fascination with astronomy at the age of five when he first saw the stars through a pair of binoculars, although he spent the first part of his working life developing a career in mechanical engineering. However, his true passion lay in the stars and his interest in astronomy took him into the realms of writing sky guides for local newspapers, appearing on local radio and television, teaching astronomy and space in schools and, in 1985, leaving engineering to become a full time astronomy and space writer. He has penned 17 books to date which have covered a range of astronomy and space-related topics for both children and adults. His journalistic work includes writing articles and book reviews for several astronomy magazines as well as for many general interest magazines, newspapers and periodicals. His passion for bringing an appreciation of the universe to his readers is reflected in his writing.